What sets power plant men apart from your regular mechanic, lineman or men of other occupations is that they are a semi-captive group of people with a lot of freedom to move about the plant and the plant grounds. This provides for the opportunity to play jokes on each other without resorting to “horseplay”. There is no room for horseplay at a power plant. The power plant man lives among dangerous equipment, poisonous chemicals, carcinogenic dust, asbestos gloves and purely evil plant managers who would love to catch one of his minions engaging in horseplay. The more elaborate yet simple joke seems to have the best effect on those who find themselves the victim. First of all, the joke must be essentially harmless. That is, no one is left injured (this rule seems to be more of a suggestion since I seemed to end up on the short end of the stick a few times). Secondly, the longer the joke takes to completion, the better. If the joke goes on for a week or longer, then the final impact of the joke is much greater. For instance. A person that you are going to play a joke on sits in a chair that is raised and lowered by turning the chair upside down and twisting the wheel bracket around (which is how you lowered office chairs before the fancier spring and air cushioned chairs arrived). Say you were to gradually lower a person’s chair each day by 1/8 of an inch or so. Eventually, in a couple of weeks, the person will be sitting lower and lower at their desk until one day they get frustrated at sitting so low that they turn their chair over and raise the chair higher. But each day, you keep lowering the chair by just a little bit until they are sitting so low again that they complain about it again and raise the chair up. This can go on indefinitely. The more people that know the joke is being played, the better in this instance. The first time I met Gene Day, I knew that he was someone that would be fun to play jokes on. I don’t know what it was about him exactly. It wasn’t that he appeared to have a lower IQ. On the contrary. He seemed to be very knowledgeable as Control Room operators go. Maybe it was because he seemed like a happy person that took most things rather lightly. He wouldn’t be the type of person that would hold something against you just because you made him look foolish in front of his peers (or you posted it on a blog for the entire world to see. — Right Gene?). It seemed like the first time I noticed Gene Day, he was standing in the Control Room and I gave him a look like I was suspicious of him and he returned the look with one that said that he knew that I might be the type of person that would play a joke on him. This surprised me, because I thought I had masked that look pretty well. Gene Day is the one standing on the right with the Orange shirt. See what I mean about he has a face that says it would be great to play a joke on him? Actually, everyone else smiling in this picture are doing so because they are in the middle of playing a joke on Gene, only he doesn’t know it yet. Throughout my 20 years of power plant life I played many jokes on Gene Day, and each time it seems that I was throttled to the edge of extinction, which meant that I had executed the joke perfectly. It seemed that each person had a different way of expressing their joy of finding out that they have been the victim of a power plant joke. Gene’s general reaction was to place his hands carefully around your neck and start rapidly shaking your head back and forth. My favorite Gene Day joke was not one that took a long time to execute, and from the time that I conceived the idea to the time that I was being strangled by Gene Day was a mere 15 hours. It began when I was driving home from work one day on my way down Sixth Street in Stillwater Oklahoma where I lived on the west end of town at the time. 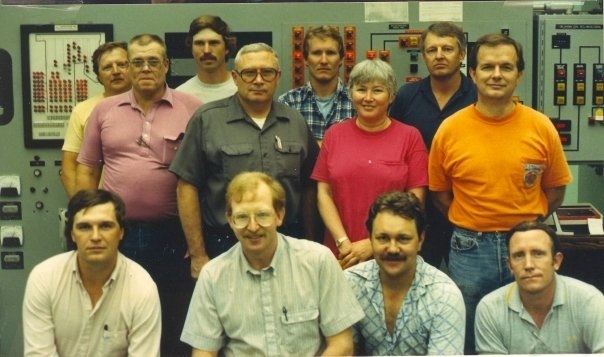 Gene Day was an operator and their shift was over an hour and a half before the rest of the plant. As I drove down Sixth Street about a block ahead of me, I saw Gene Day’s truck pull away from the Rock House Gym travelling in the same direction. 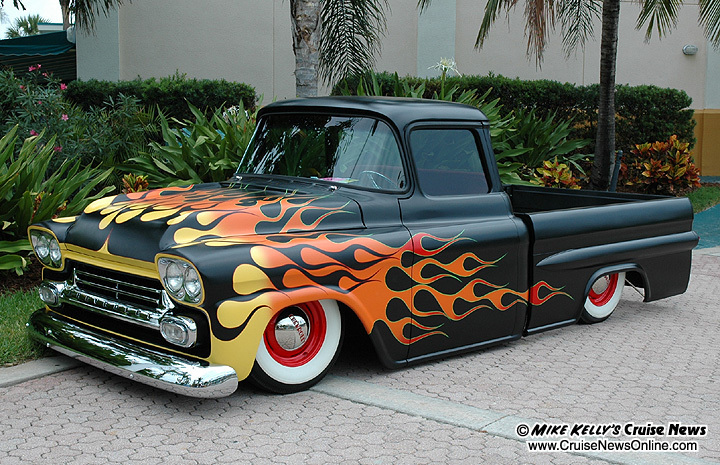 Gene had a black pickup with flames on the side…. Something left over from High School I think… The only one in town like it. I kept an eye on his truck to see where he went, and as he passed the Stillwater Hospital he pulled into an Eye Clinic and parked in the parking lot. I drove on past and pulled into my driveway about 3 blocks further on. As I checked my mail I decided to go to the bank to deposit some checks I had received. I returned to my car and pulled my car out of the driveway and headed back into town. Gene Day just happened to turn onto Sixth Street in front of me again as he left the Eye Clinic and proceeded to go down Sixth street in front of me. So again I watched him to see where he went. Just as I came to Duck Street, I saw Gene Day pull his truck into the Simon’s Gas Station on the corner of Duck and Sixth. He had pulled his truck up to the garage instead of the pumps, so I figured that he was getting his truck inspected. I turned on Duck street to go to the bank drive-thru about a block away from the gas station. After taking care of my banking business, I left the bank and headed back home toward Sixth Street. I arrived at the corner of Sixth Street just in time to see Gene Day pulling out of the gas station and heading off in the opposite direction toward his house. I thought that he hadn’t been at the gas station very long so he probably had just had his truck inspected. The next morning when I arrived at the plant I walked by Gene Day’s truck on the way to the electric shop and I looked to see if he had a new Safety Inspection sticker. He didn’t have any Safety Inspection sticker which meant that his truck had failed the inspection. 5:07 Gene Day arrives at Cockrell Eye Care Center where he meets with a nurse in his pickup truck in the parking lot. 5:20 Gene Day leaves Eye Care Center. I folded the paper in half and after I began work, I headed to the Control Room to see how the Electrostatic Precipitator was doing. I sat at the computer by the Control Room door that opened up to the Turbine Generator room. After a while Gene Day walked by on his way to pick up the mail from the front office. I waited about 30 seconds and followed him out onto the Turbine Generator (T-G) floor. 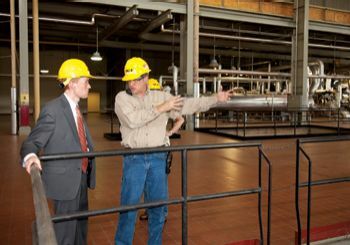 The T-G floor at Sooner Plant is painted bright red and the floor is kept clean so that the lights overhead reflect off of the floor. The Control Room is halfway across this large room about 200 yards long. The office area is at one end. I walked over to the door that leads to the Office area and laid the half folded paper in the middle of the floor. I figured that Gene wouldn’t be able to resist picking it up to see what it said. Then I went back to the Control Room and leaned against one of the big blue monitors used by the Control Room Operators to view alarms. I acted surprised as if I didn’t know what he was talking about. Somehow he figured I was behind this, but for the life of me I don’t know why…. He tried to explain to me that he had stopped to see his wife who is a nurse at the Cockrell Eye Care Clinic, and that there wasn’t any girl named Bunny. He couldn’t figure out how I would know that he tried to get his truck inspected and it failed inspection…. I insisted that I didn’t know what he was talking about. About that time, the room became blurry as my head was shaking back and forth, and I came to the realization that this joke had been performed perfectly. Gene Day is the one standing on the right with the Orange shirt. See what I mean about he has a face that says it would be great to play a joke on him? Throughout my 20 years of power plant life I played many jokes on Gene Day, and each time it seems that I was throttled to the edge of extinction, which meant that I had executed the joke perfectly. It seemed that each person had a different way of expressing their joy of finding out that they have been the victim of a power plant joke. Gene’s general reaction was to place his hands carefully around your neck and start rapidly shaking your head back in forth. I acted surprised as if I didn’t know what he was talking about. Somehow he figured I was behind this, but for the life of me. I don’t know why…. He tried to explain to me that he had stopped to see his wife who is a nurse at the Cockrell Eye Care Clinic, and that there wasn’t any girl named Bunny. He couldn’t figure out how I would know that he tried to get his truck inspected and it failed inspection…. The more elaborate yet simple joke seems to have the best effect on those who find themselves the victim. First of all, the joke must be essentially harmless. That is, no one is left injured (this rule seems to be more of a suggestion since I seemed to end up on the short end of the stick a few times). Secondly, the longer the joke takes to completion, the better. If the joke goes on for a week or longer, then the final impact of the joke is much greater. For instance. A person that you are going to play a joke on sits in a chair that is raised an lowered by turning the chair upside down and twisting the wheel bracket around (which is how you lowered office chairs before the fancier spring and air cushioned chairs arrived). Say you were to gradually lower a person’s chair each day by 1/8 of an inch or so. Eventually, in a couple of weeks, the person will be sitting lower and lower at their desk until one day they get frustrated at sitting so low that they turn their chair over and raise the chair higher. But each day, you keep lowering the chair by just a little bit until they are sitting so low again that they complain about it again and raise the chair up. This can go on indefinitely. The more people that know the joke is being played, the better in this instance. The first time I met Gene Day, I knew that he was someone that would be fun to play jokes on. I don’t know what it was about him exactly. It wasn’t that he appeared to have a lower IQ. On the contrary. He seemed to be very knowledgeable as Control Room operators go. Maybe it was because he seemed like a happy person that took most things rather lightly. He wouldn’t be the type of person that would hold something against you just because you made him look foolish in front of his peers. It seemed like the first time I noticed Gene Day, he was standing in the Control Room and I gave him a look like I was suspicious of him and he returned the look with one that said that he knew that I might be the type of person that would play a joke on him. This surprised me, because I thought I had masked that look pretty well. Throughout my 20 years of power plant life I played many jokes on Gene Day, and each time it seems that I was throttled to the edge of extinction, which meant that I had executed the joke perfectly. It seemed that each person had a different way of expressing their joy of finding out that they have been the victim of a power plant joke. Gene Day turned onto Sixth Street in front of me again as he left the Eye Clinic and proceeded to go down Sixth street in front of me. So again I watched him to see where he went. Just as I came to Duck Street, I saw Gene Day pull his truck into the Simon’s Gas Station on the corner of Duck and Sixth. He had pulled his truck up to the garage instead of the pumps, so I figured that he was getting his truck inspected. I turned on Duck street to go to the bank drive-thru about a block away from the gas station. After taking care of my banking business, I left the bank and headed back home toward Sixth Street. I arrived at the corner of Sixth Street just in time to see Gene Day pulling out of the gas station and heading off in the opposite direction. I thought that he hadn’t been at the gas station very long so he probably had just had his truck inspected. I folded the paper in half and after I began work, I headed to the Control Room to see how the Electrostatic Precipitator was doing. I sat at the computer by the Control Room door that opened up to the Turbine Generator room. After a while Gene Day walked by on his way to pick up the mail from the front office. I waited about 30 seconds and followed him out onto the Turbine Generator (T-G) floor. The T-G floor at Sooner Plant is painted bright red and the floor is kept clean so that the lights overhead reflect off of the floor. 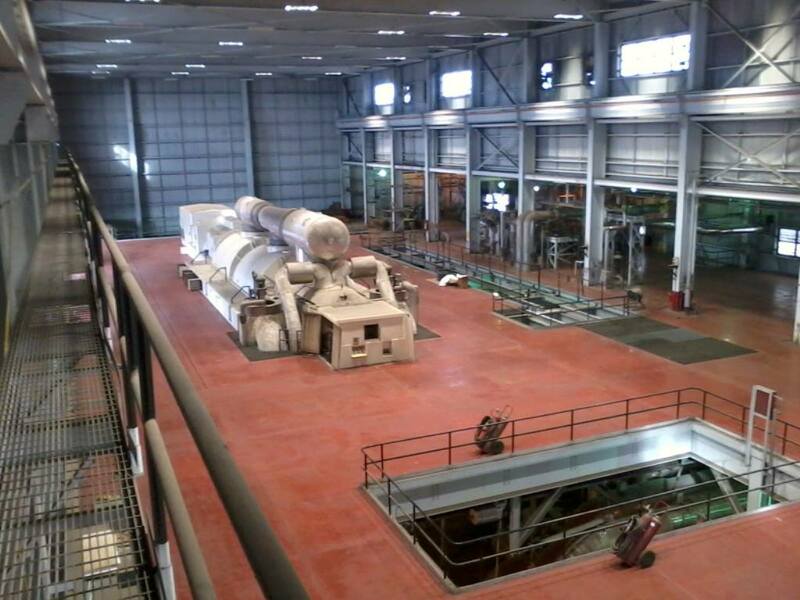 The Control Room is halfway across this large room about 200 yards long. The office area is at one end. I walked over to the door that leads to the Office area and laid the half folded paper in the middle of the floor. I figured that Gene wouldn’t be able to resist picking it up to see what it said. Then I went back to the Control Room and leaned against one of the big blue monitors used by the Control Room Operators to view alarms. After a few minutes, Gene Day walked into the Control room. In one arm he carried various parcels of mail. In the other hand, he was carrying the yellow paper I had left for him to find. He was violently shaking it at me yelling, “How did you do this?!? !” I acted surprised as if I didn’t know what he was talking about. Somehow he figured I was behind this, but for the life of me. I don’t know why…. He tried to explain to me that he had stopped to see his wife who is a nurse at the Cockrell Eye Care Clinic, and that there wasn’t any girl named Bunny. He couldn’t figure out how I would know that he tried to get his truck inspected and it failed inspection…. I insisted that I didn’t know what he was talking about. About that time, the room became blurry as my head was shaking back and forth, and I came to the realization that this joke had been performed perfectly. This is a revised version of a post that was originally posted on 1/14/2012. I am reposting last years posts each Tuesday.